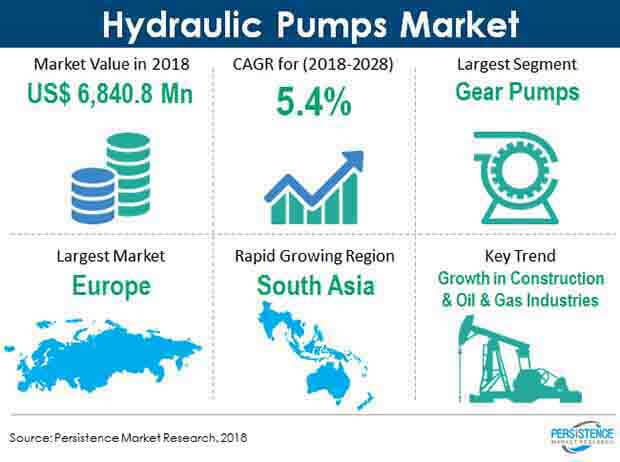 Persistence Market Research, in its recent study on the hydraulic pumps market, offers a detailed value-volume analysis of the hydraulic pumps market on the basis of various segments such as product type, operation, end use and region. In terms of product type, the gear pump type segment is estimated to lead the market share in terms of value, while the bent axis hydraulic pumps segment is projected to be a lucrative segment in the hydraulic pumps market. Hydraulic pumps are widely used among industrial applications as key components of hydraulic systems. Hydraulic pumps find a large number of applications in end-use industries, particularly construction, material handling, oil & gas, chemicals and agriculture, which require the use of simple or complex hydraulic systems in their day-to-day operations. With these end-use industries projected to witness significant growth in the coming years, the hydraulic pumps market is expected to experience robust growth opportunities over the forecast period. The hydraulic pumps market report covers market analysis through basis point analysis (BPS), incremental dollar opportunity index, market attractiveness analysis and Y-o-Y growth for the historical period 2013–2017 and a forecast analysis for 2018–2028 with 2017 as the base year. The hydraulic pumps market report begins with an executive summary covering a gist of the overall report, highlighting the global hydraulic pumps market overview in terms of value and volume through various segments. The section also covers key supply and demand side trends, technology roadmap, PMR analysis and recommendation in the global hydraulic pumps market. The market introduction section of the report covers market definition, market taxonomy and research scope of the hydraulic pumps market. The market background section of the global hydraulic pumps market report includes macroeconomic factors along with value chain analysis, drivers, restraints, trends, and opportunities, along with forecast factors affecting the hydraulic pumps market growth. The market forecast section provides a pricing analysis of the hydraulic pumps market on the basis of regional fronts, wherein the weighted average price has been computed to arrive at the global average prices. This section also covers global market analysis on the basis of segments, along with regional segmental analysis in terms of volume and value, Y-o-Y growth, market attractiveness index and market share. This section covers the hydraulic pumps market analysis for the key emerging countries that are projected to create lucrative growth opportunities for hydraulic pump manufacturers around the world. In the final section of the hydraulic pumps market report, a detailed competition analysis was done with market share analysis pertaining to the hydraulic pumps market and performance of manufacturers by a tier-down structure of the global hydraulic pumps market. The section also covers detailed company profiles of key players in the hydraulic pumps market report. Examples of some of the key competitors in the hydraulic pumps market are Bosch Rexroth AG, Eaton, Flowserve Corporation, Graco Inc., Actuant Corporation, Mitsubishi Heavy Industries, Danfoss A/S, PWG S.r.l., HYDAC, Yuken India and Tuthill Corporation, among others. The first stage of the hydraulic pumps market research entailed the formulation of a preliminary hypothesis, which was considered from primary as well as secondary approaches. To analyse the hydraulic pumps market share and competition analysis section, we tracked key developments in the hydraulic pumps market, such as collaborations, expansion, mergers & acquisitions, new orders, product launches, awards and recognition for companies operating in the market. Competition benchmarking has been provided for the top 5 competitors with respect to sales performance of hydraulic pumps. Growing adoption of piston pumps in various pumping application is expected to drive the growth of different piston type pumps over other pumps in the product type segment in hydraulic pumps market. One of the key factors driving the growth of the hydraulic pumps market is rapid industrialization and urbanization in key developing countries such as China and India. These countries are in a phase of witnessing rapid industrialization due to growing urban population. This in turn has led to an increase in consumer needs and products, which has been affecting the growth of end-use industries. The cumulative growth of end-use industries has directly impacted the demand for hydraulic pumps. With a large number of manufacturing industries being set-up, and planned expansions taking place across industries, the demand for hydraulic pumps is expected to witness robust growth during the forecast period. Governments of emerging economies in Africa and Asia, particularly in countries such as India, China and South Africa, are increasing efforts to improve access to drinking water in rural as well as urban areas. With the increased investments and activities undertaken by respective governments, the demand for hydraulic pumps is set to witness significant growth in the coming years. Fire-resistant hydraulic fluids are new hydraulic fluids that are gaining significant momentum in demand from key end-use applications. They possess a higher water content of up to 45%, which enables better lubrication, reduces wearing and offers better corrosion resistance to moving parts. Hydraulic pumps tend to wear out easily as they are operated continuously for long stretches of time, which leads to an increased need for better hydraulic fluids to improve the life of hydraulic pumps. The global hydraulic pumps market represents a fairly fragmented competition landscape wherein Tier-1 companies hold about a 35–40% revenue share. Important entrants in the hydraulic pumps market such as Optima Hydraulik Germany MARCH PUMPEN GmbH are focusing on domestic markets to hold a significant market share in the largely fragmented hydraulic pumps market.